Early in the fourteenth century the Grange became disjoined from the Abbey and it`s service ceased. In 1322 King Robert the Bruce granted the lands to Sir William Durham as a reward for faithful service rendered as a knight. 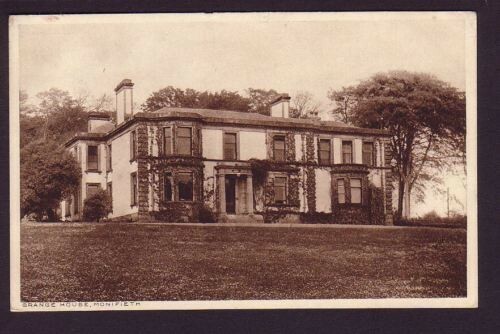 For four hundred years the Grange remained in the possession of the Durham family. on his way to the Tolbooth in Edinburgh and subsequent execution. had a famous heroine on par with Flora MacDonald. Grange House is finely situated on rising ground, having a Southerly exposure, from which may be seen the river widening out into the German Ocean. The present building is of quite recent date, or at least most of it, but the site is that on which stood the ancient Castle of Grange. When workmen were laying out the grounds they came upon the foundations of the old castle a little to the west of the present building, which were as firmly bound together as if time had only the effect of consolidating them. The trees in the park are tall stately and luxuriant, a more pleasant retreat is not to be found within the district. Present House built in 1829, a small classical mansion by James Black with sumptuous seventeenth century Renaissance gate, piers of caps, finials, mouldings and the like. This entry was posted in Famous buildings and tagged Ashludie, Durham, Montrose. Bookmark the permalink.